The last 2 weeks have been really busy for the band. On the 4th of July we played at Acocks Green Carnival. This is a great community event that we have played at for at least 8 years. It is a nice march down the high street to the local park where the organisers’ put on some great arena events and there is lots more to do including fair ground rides and charity stalls. (See pictures in 2015). The weather was great and the band had a good turnout with 16 of us playing. That was the warm up for the following weekend which was very busy. Saturday 11th July we played the Astwood Bank Carnival. Again, this is a carnival we have played for many years and the crowd seems to be getting bigger and bigger each year, A few years back there is a long stretch of road that was fairly sparse of people. Now, it is really full of people watching a great carnival procession. 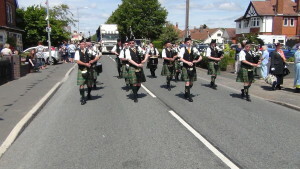 There are walking groups, cadet bands, dancers and many great floats all offering a different type of entertainment. It was a beautiful warm day and many of the pipers ended up with piper burn. Where only certain parts of your arms are red, (very red!) and the rest of your arms are white. Sunday the 12th July was extremely busy. We were competing at The Corby Highland Games and were up against another 6 very good bands. We were scheduled to play at 12.40pm and began to start tuning at 11.40am. The sky was clear and all was good. Then, the heavens opened..we got soaked. We sheltered under some trees but it did little to help as the torrent of rain was so heavy it literally parted the branches and leaves and continued to drench us. Pipe Major Bill Grigg took a run up to the fair ground that was located in the park nearby and found a friendly Wurlitzer owner who due to the rain was doing little business and let us tune up under the cover of his rides roof, A big, big thanks to that fella! The start was put back by half hour due to the weather and needless to say our preparation was not great. 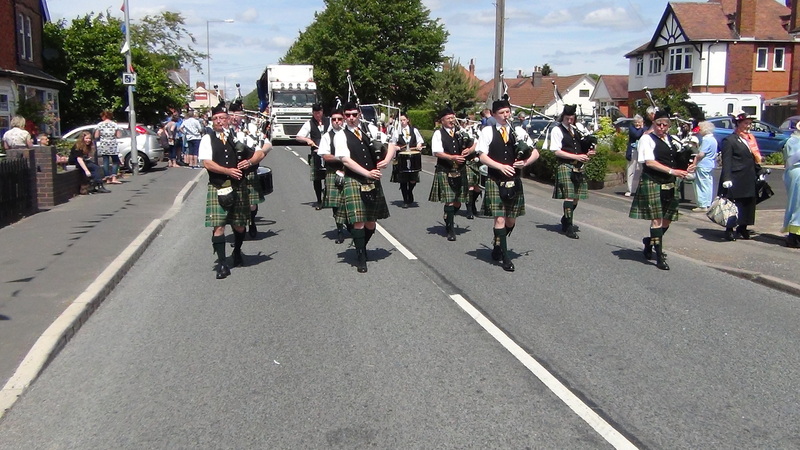 As the band marched off playing Pipe Major Bill Grigg was left as the solo player at the top of the stage to finish the tune. There was a great round of applause from the audience in appreciation of the bands performance. The whole band would like to thank Bob Brolly for the opportunity to play at such a great event in such a great arena and we wish him great luck in his fundraising ventures this year and every year. So, that was a weekend that was! Now it is practice time for competing in the All English Pipe Band Championships at Chatsworth House on September 6th and the St Patrick’s Day Parades in March 2016. No doubt there will be a lot more events that will pop up before then so please keep an eye on our posts and feel free to send any comments back to us.